skip ahead in your songwriting. 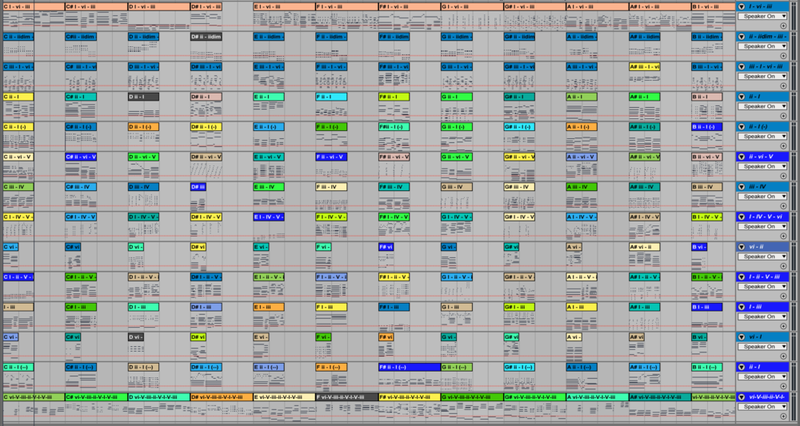 Our massive collection of MIDI chord progressions is finally here! Jumpstart your next production by selecting from over a thousand unique clips organized by key and genre. Whether you want to inspire your own playing or use them as the basis of a song, these progressions will get your track started right away and allow you to focus on the more creative aspects of producing. Take the guesswork out of your song's harmonic foundation with the 1001 Chord Progressions MIDI pack! Available now for a special introductory price of just 2 cents per MIDI clip! Packs that offer lots of MIDI progressions in many different keys are often transposed, quantized, and robotic. Not so with the 1001 Chord Progressions pack - all thousand MIDI clips were performed by hand to feature unique rhythms, humanized timing, natural velocity variation, and guiding melodies and flourishes. Starting a song requires more than a nice series of chords - it needs the feeling a great musician can bring. Consider these chords the best value session musician you'll ever collaborate with. Our MIDI pack features 228 pop progressions, 240 rap progressions, 216 rnb progressions, 111 gospel progressions, and 206 rock progressions. Whether you're working in these genres or just want to introduce some of their stylings into your production, the chords in this pack are the perfect place to start. With so many amazing progressions to choose from, you'll never feel stuck in building the core harmonic framework of your song. Mix and match clips to string together verses, choruses, and bridges with ease so you can get right to sound design, melodies, and creative production. Songs leap right out of the 1001 Chord Progressions, offering a solid foundation for your best work to build off of. jumpstart your rhythm section too. Our 1001 Hip-Hop Drums pack is the perfect companion for the 1001 Chord Progressions pack. Producers can drag and drop humanized MIDI drum patterns into their project to trigger any of the thousand sounds offered in the download. A solid foundation in harmony and rhythm is all you need to create amazing productions. Let our "1001" packs help get you there with ease.